Tasty Latin-American inspired cuisine with fresh made from scratch ingredients. Whether you are looking for a fun place to watch the game or family dinner night out; Cheeky is the place for you. From delicious tacos to sizzling fajitas to crisp salads. When you think food think Cheeky. 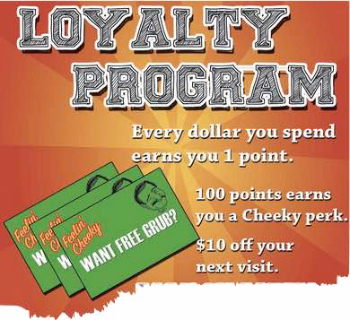 Join our Cheeky Loyalty Program today, and every dollar you spend earns you 1 point, and every 100 points = $10 off your next visit!